Dream, Create, Inspire: Where Bloggers Create - Blog Party! Today is the day we've all been waiting for - having a sneak peek into other artist's blogging and creative spaces. What fun! 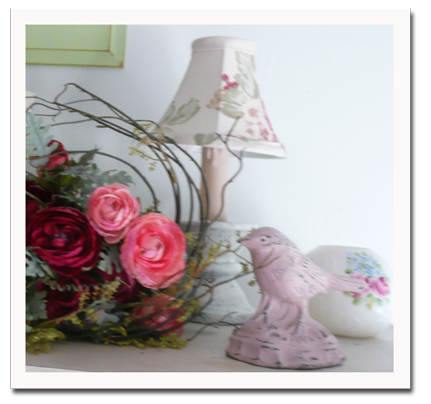 It's all happening on Karen Valentine's blog, My Desert Cottage. This is the second year Karen is hosting this fabulous blog party and there are more that 450 party guests participating this year - WOW!!! So make yourself a cup of your favorite beverage, sit back, relax and enjoy the tour. Welcome to where I Dream, Create & Inspire. This is the wall I face when I sit at my desk and it is filled with various cubbies and shelves holding lots of treasures and supplies. I like using suitcases to store (and hide) lots of fun things. Scattered throughout the room I have beloved items I have purchased, like the tiny spun cotton cat figure I picked up from Vintage by Crystal shown below. Here is one of my original collages, a few vintage books and a dancing girl given to me by a favorite friend. The second "book" down from the top is actually a bank given to me when I was a baby. These are some of my Inspiration Boxes I received from swap partners in Heather's Inspiration Box Swaps. Right now I'm working on her latest swap theme - The Paris Edition. This cubby opening used to hold a TV. The shadowbox frame I picked up a couple years ago at Michael's filled up the space nicely along with some mercury glass pieces. 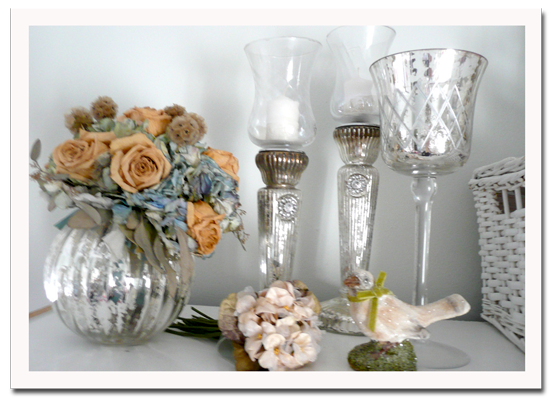 A side table holds more of my "pretties." My DH built this behind-the-door storage for my rubber stamp collection years ago. Hanging in front are more goodies from a swap partner. 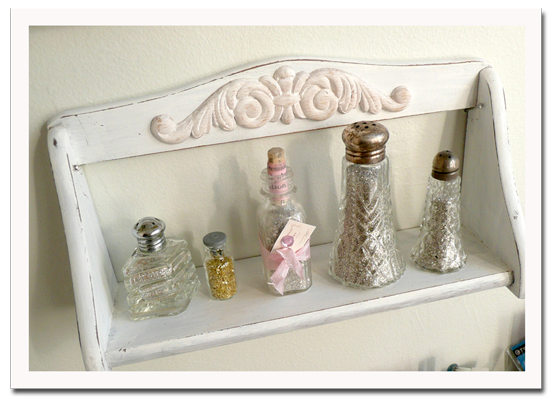 I found this little spice shelf at Goodwill, painted it white, added the wood scroll work and it now holds some of my favorite antique shakers filled with glass glitter. This old rubber stamp spinner, another vintage find, holds even more glitter. In my opinion, a girl can never have too much glitter. 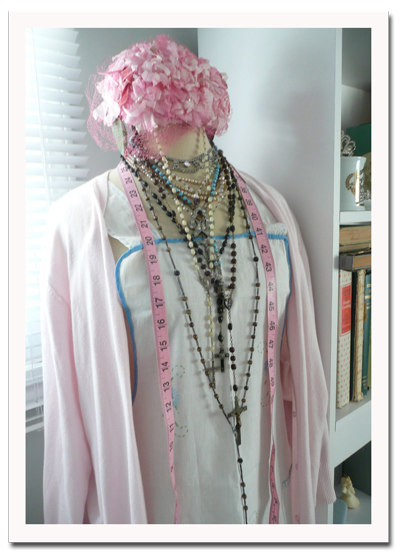 Here's my mannequin I picked up at the flea market. She currently is without a name. Hmmm....got any ideas? A sign bearing the name of my Etsy Shop which I made years ago. 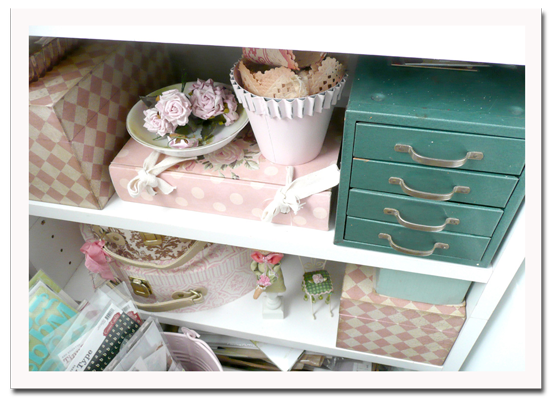 The striped metal storage boxes are a Homegoods find. 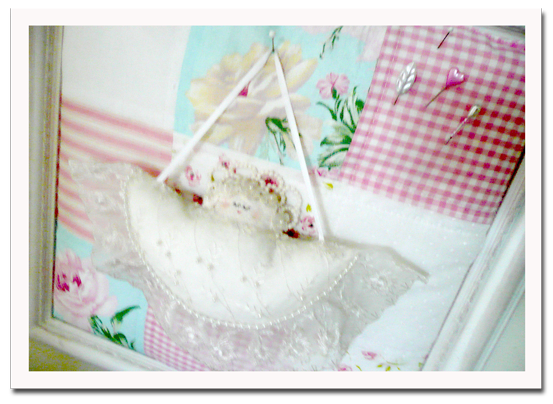 An angel made from vintage hankies found at a craft show and a hand-crafted pin board is from the craft mall I used to work at. I have several inspiration boards throughout my studio. These bookcases sit behind my desk. 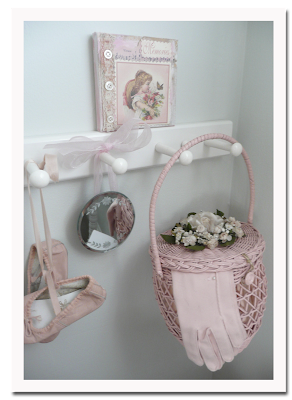 The shelves hold lots of pretty treasures and the cupboards on the bottom of each of them hold supplies I use often. Here's some of my vintage book collection. The flowers below are actually a bridesmaid bouquet from my daughter's wedding that dried beautifully. The candle holders were used on the place card table. 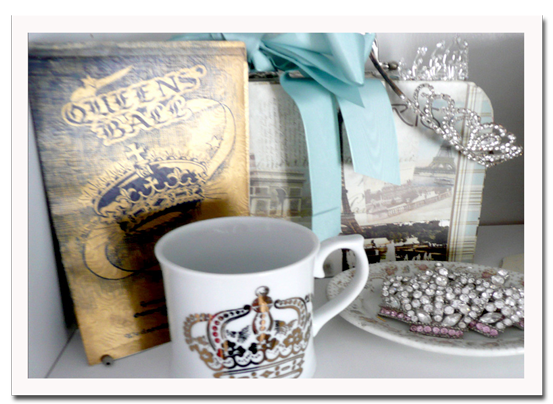 Crowns seem to be a theme that keeps repeating itself all over the room. 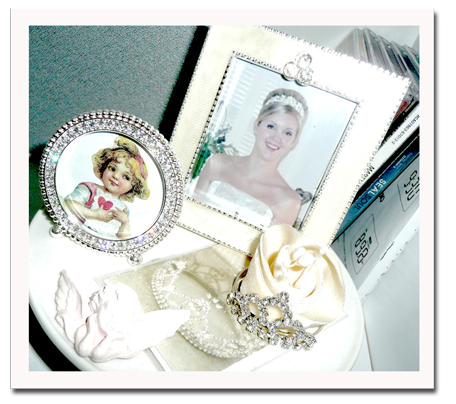 That's my beautiful daughter on her wedding day in the photo above. And a vintage program for the Queen's Ball shown below. I love anything related to birds and nests - here's a few special ones. 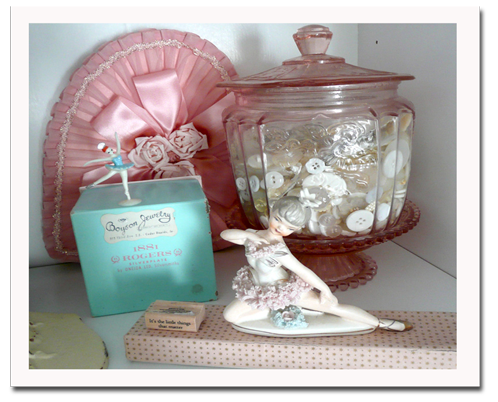 Ballerinas, an assortment of vintage boxes and mother-of-pearl buttons. 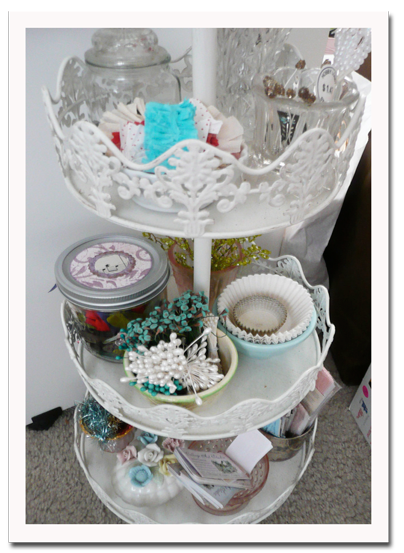 This three-tiered caddy sits next to my desk and holds all sorts of small supplies. Tiny shelves hold tiny treasures. 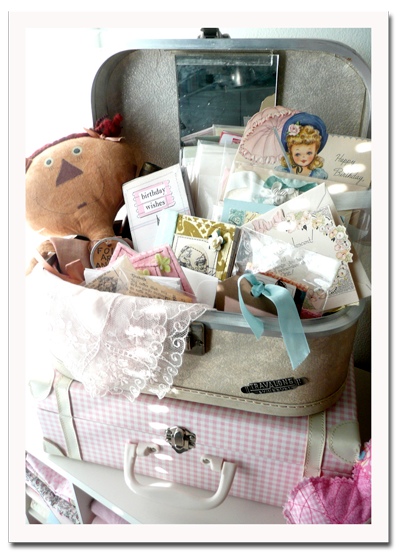 More vintage goodies and a swap partner's collage. 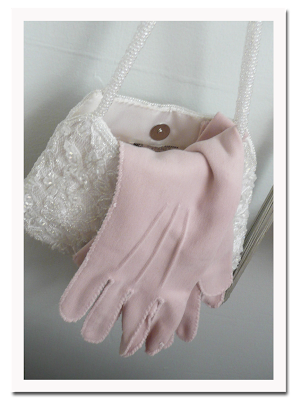 Vintage pink gloves and a white beaded hand-bag. 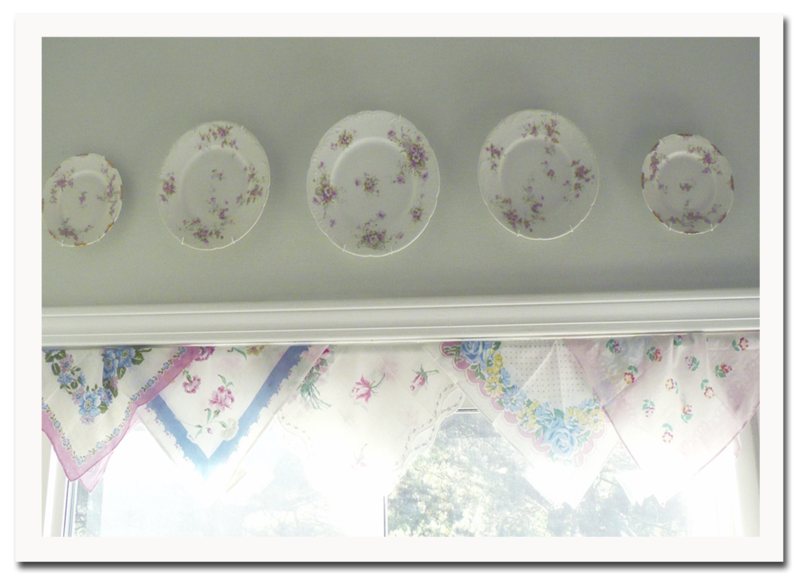 I use vintage rose patterned Limoges china plates all over the house. This collection hangs over a vintage hanky valence above my studio window. I hope you've enjoyed this tour of my creative space. You can see lots more studios by clicking here and then going to the sidebar of Karen's blog where she has links to all the other party guests. Happy visiting!!!! Oh my! This is such a gorgeous studio! I love the color palette! And all the sparkle! 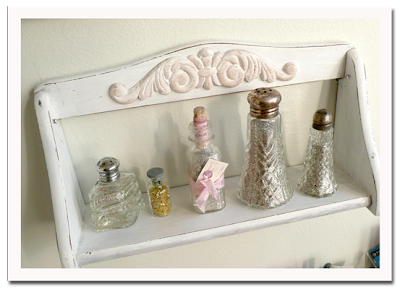 What a cute idea with the s&p shakers on the old rack! It looks like a great place to get creative! YOu have a wonderful studio! I love how the inspiring pieces (both new and vintage) that are all over the room. Jeanne what a wonderful studio. So many beautiful supplies. Just dreamy and inviting! I love the colors and the painting! Beautiful of you to invite us in. Blessings dear. I've been patiently waiting for this tour of your room. It's no wonder that you feel so inspired there..I feel inspired just peeking in! 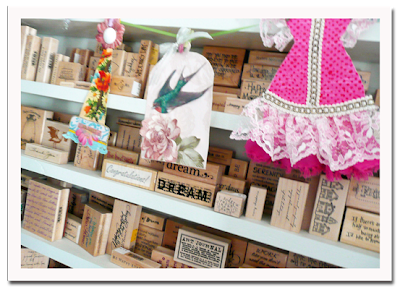 Rubber stamp holders have so many uses..I like yours with bottles of glitter, mine holds hand punches. I love this party...don't kno if I'll get to everybody but I'm certainly visiting my favorite blogs...yours is way up there. Thanks for the tour Jeanne! Hope you have time to visit mine. very pretty and I love your music. Your studio is precious, I love the soft pastel colors and girly feel. Your artwork is just amazing. 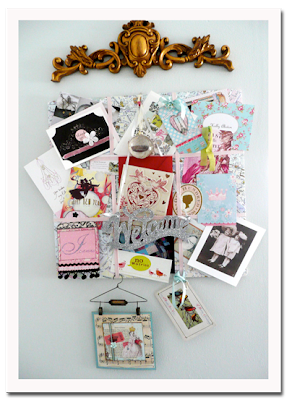 I love the idea of behind the door storage, I need to give that idea some thought for my space. Thank you for sharing your creative haven. What a fabulous creative space! 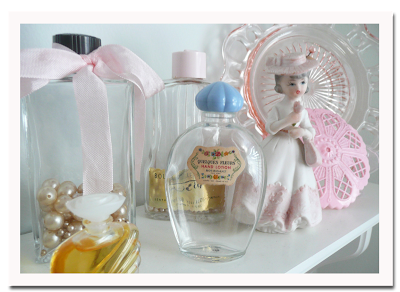 Love all your vintage pretties! It's just dreamy and makes me want to be there! Wow, such a great creative space! Love your chandelier! So many great things! So, enjoyed my visit with you. Enjoy the rest of the party. Your blog is stunning -- certainly wont be my last visit here. I am so excited to see all these talented women! If you get a chance I would love for you to stop by... have a lil give away going on. Enjoy your visits -- they certainly will be tickled they stopped by your spot! What pretty details every where you look! I love the book marks in the vintage book collection. Wow...so Lovely...what a super gorgeous studio tour...I love the dreamy color palette..so beautiful!What wonderfully inspiring treasures! Stunning and charming ! 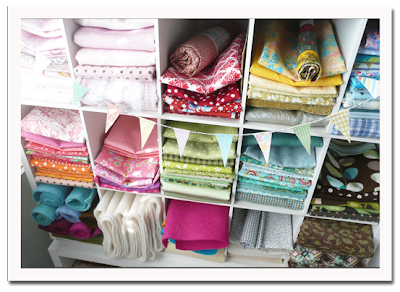 Wow- so many good ideas- love the glitter shakers,your inspiration boards and how you have your fabric stored- I think I'd be much more likely to use my fabrics and linens if I could see them- and yours are so pretty. your space IS inspiring! My craft room is not fit for human eyes right now....but all these beautiful studios has inspired me to clean it up and re organize! It was great fun getting a glimpse of your studio....I love all of the little details!I named my dress form Emma....it would've been the name to my 2nd little one if I had one....good luck finding a name for your companion:) This has been quite the party....so glad I joined in the fun! what a fun and lovely tour through your studio. so many pretty and cute things. 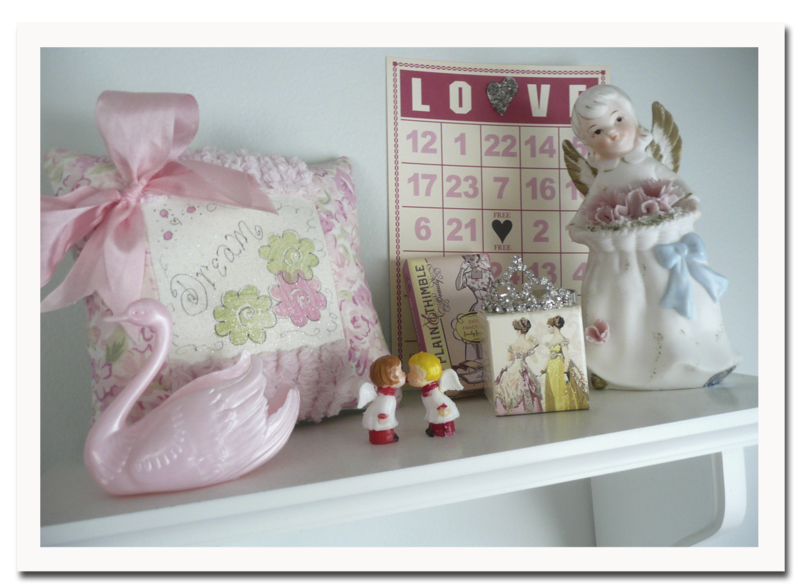 love the soft colors, gifts from bloggers, supplies, shakers filled with glitter! hankies, of course! really sweet. thanks so much for sharing your space. so fun to see where you create. Your studio space is so pretty Jeanne! I can see your sweet personality all through it! What a pretty room! I love the window with the pretty plates and hankies!! I'm so glad you let us have a peek! Oh Jeanne I have to say that your studio space is so very beautiful. I love every inch of your creative space. The soft colors are so inviting and so many pretty details. I love the rageddy doll popping it's sweet head out of the vintage case and your lovely fabrics so neat and tidy. You have created a wonderful space to create pretty art. Absolutely beautiful! 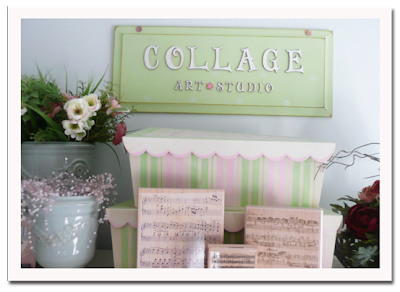 I love the sweet, soft touches throughout your studio. Jeanne, you obviously have filled this space with items that have lots of meaning and inspire you. A beautiful place to create beautiful things. Thanks for sharing. 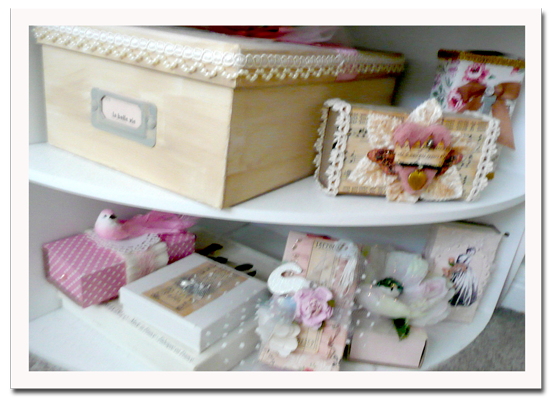 Your studio is full of lovely things and so charming! I just adore all the little cubby holes and shelves and different ways you display and make things. Gorgeous!!! Hi Jeanne, lovely!!! What's not to love about this charming space. So inspiring. Jeanne, this space is SO beautiful! I love seeing all of the beautiful artwork that you have made and recieved... and love how you have your shakers displayed on that pretty white shelf. I loved getting a peek into your space! 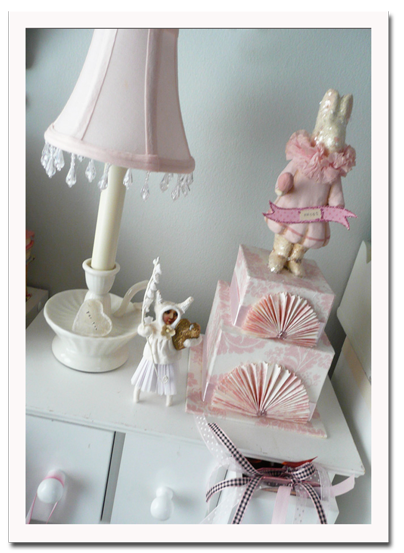 What a lovely soft and inviting space, I love all the pinks and blues. Thanks for sharing. I had to come by and see your pretty little studio. what a wonderful creative space you have. 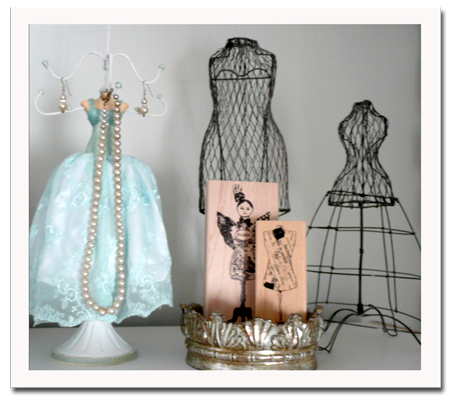 you have so many awesome things that should appeal to creative muses everywhere. Hello Jeanne! Your studio is so pretty. I love how you used the stamp holder and salt shakers for your glitter. I could get lost in there for hours oohing and aahhing. I so appreciate your kind comment on my studio. Such a lovely, dreamy place to create! 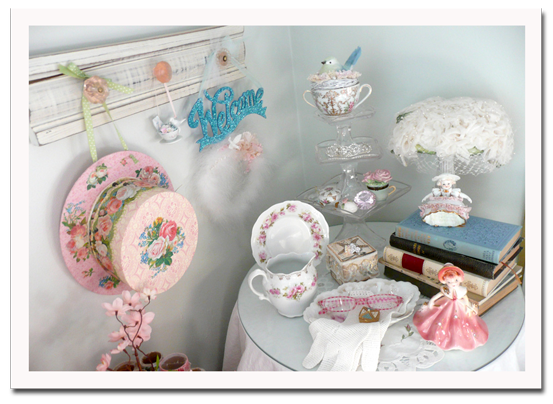 Love all your shabby sweet touches and especially the adorable hankie window treatment. So creative! 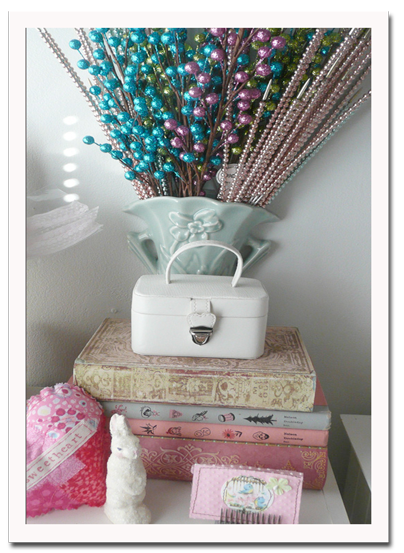 love it...all the best colors, and sparkles and treasures!!! This is an incredible studio. I can see it is full of love. I love your different crowns and your glitter shakers and your salad spinner. So many things. The colors are just dreamy and the musical background is beautiful. Thanks you for sharing it with us! 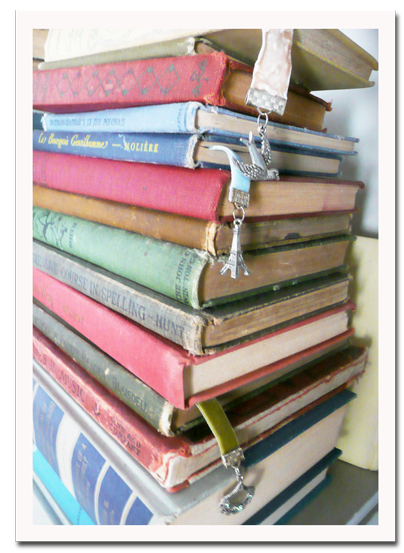 I love all of your vintage books and beautiful book marks...they are my fav! Jeanee your room is just lovely! There are so many wonderful things to look at! 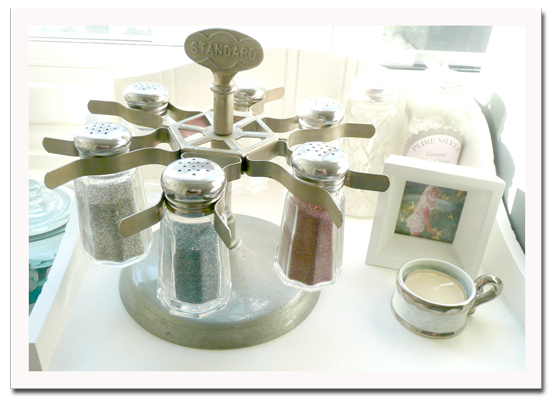 I love the use of the vintage salt shakers for glitter! Thank you so much for coming to the party! I loved the tour. I am in love with your studio! Everything is beautiful and a treat for the eyes. Thank you so much for sharing it with us. 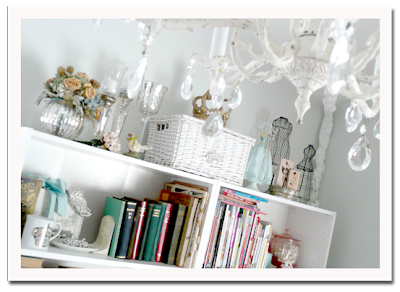 What a lovely space you have and I'm envious of all your collections! Wow! I'd love to explore that space...thanks for sharing. Oh, it's magical, Jeanne! Thank you for inviting us into your gorgeous studio! You have such a light and dreamy space - it must be a joy to work in there. I especially love the vintage hankie valance. It looks so lovely with the light coming through. Thank you for sharing. I love you charming creative space all the treasures you have collected and your choice of colors...happy and bright...you've displayed them and your art work perfectly. What a beautiful studio! I also love old salt shakers to store buttons, pearls and other things and I also have one of those small, green, metal cabinets on my desk - I love it! I will come back to visit when I can stay longer. Thanks for sharing your space! 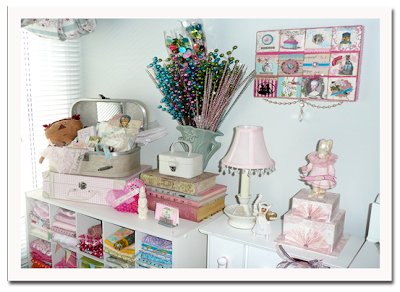 I love your room - it's so pretty and neatly organized! 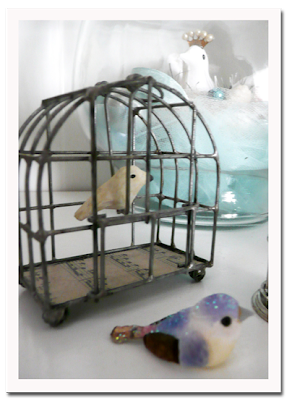 I found one of those stamp holders too but had no idea what to do with it - thanks for such a great idea! And thanks for sharing your room! Thanks for the peak inside your lovely studio!!! I love love love everything!!!!!! Love, love, love your studio Jeanne...it's fabulous! Congrats on the mention in Romantic Homes! Oh what lovely stuff you have!! Another vintage lover..so many of us these days..it's just the best! Thanks for sharing your space with me. I really enjoyed looking at everything. I'd love to have you come take a stroll through my studio...it's been a labor of love to get it all in place..what a journey this past year has been! This is so heavenly. I love the sweet colors. Love the beautiful treasures. All the mannequins, birds, vintage items. It is wonderful. All the fabric stash. Great creative place. Thanks for sharing your lovely place. It would be fun to peek through all the little nooks and crannies.. Thanks.. Really beautiful. Oh my gosh, I just love your beautiful studio. It holds everything that makes me smile. So much beauty surrounding you while you create. I love your colors, and all your awesome storage ideas. Your artwork is beautiful. Thanks for sharing. I live by those 3 words- I Dreamed- Love to Create- and have been so inspired by so many-and hope to inspire.Love this sharing of spaces. Glad to of met you. What a fun fun room!!!! And the use of the stamp holder for your glitter shakers??!! VERY good idea - loving that!!! 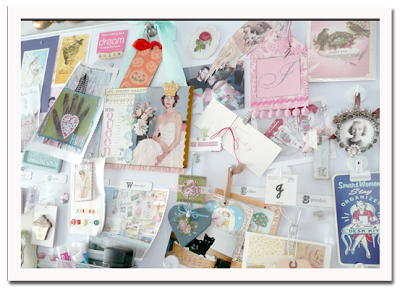 Your inspiration boards rank high on my favorite list too!!! And stamps?! Looks like you have some wonderful rubber stamps! Oh what fun I could have in there! Thanks so much for sharing - we had a great time! You have an absolutely beautiful studio. The vignettes you have created make the room look so warm and inviting. I can tell this is really a place to create and dream. You have certainly inspired me. All your storage solutions are perfect, from the boxes to the salt and pepper shakers. Thanks for sharing your space. So bright and feminine! I just have to say I can't believe how many studios have full size mannequins in them! Love, love, love your studio, Jeanne! From the color on the wall to the colors that surround you, it looks like a great room to create in. I also love how your supplies have become decorative display items. Everything is very pretty and definitely inspiring! Some really lovely display ideas. Very nice space. I especially like that use you found for the old stamp holder. Very clever! Oh I just love your space! So airy and white! Love all of the organization ideas too! Wow, I don't know what to comment on first so I'm going to just plain say WOW! 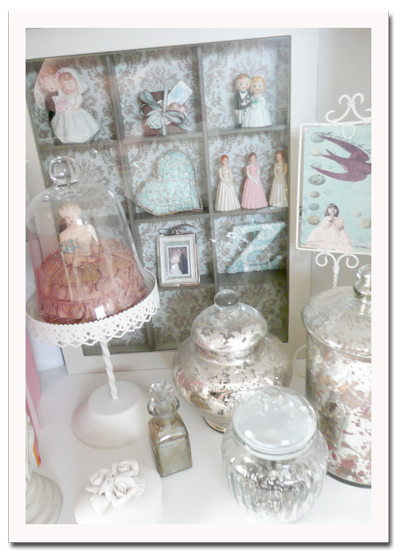 I love how you've displayed all your treasures. Thank you so much for letting us peek into your studio. 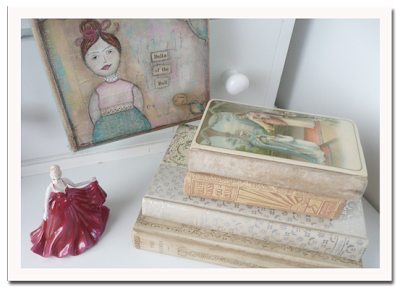 Very pretty space, and there is so many little things that I like... Like the light coloured vintage books, the teal blue tool box and so many other things. Will there be another Paris box exchange again? I think I would like to take part in one, never done a exchange before. lovely space! Such neat little cubbies with fold of fabric...very nice. I also like the vintage suitcases and books in your studio. Where does a person start? I am a papercrafter, scrapbooker and of course love your collection of stamps! Will try and come up with a name for the manequin too... I have been inspired by all the blogs to put my glitter, well some of it in shakers but dont you know now that I want to I cant find a one at a garage sale! I am a newbie to the blog world (2 wks!) am am so inspired by the blogs that I view. Thank you for being a part of that inspiration today! ~Sherry F.
Hi, thought I would make some more WBC rounds. I visited earlier, but did not get to leave a comment. I love your studio and all the pretty details you have created, very pleasant surroundings. Your studio is so precious! I could lose myself in your studio, so girly girl. Just beautiful, thanks for sharing. Jeanne, I just discovered your blog today. I found a link on My Desert Cottage's Where Bloggers Create. Your studio is delightful! Exactly what I am trying to achieve in mine. 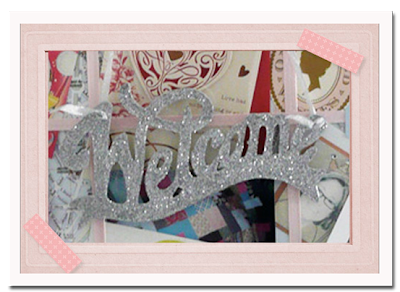 I am taking away a few ideas...love the glitter shakers in the stamp holder! I have one sitting in my art nest right now! Love your space!